It was just Ben for Wednesday. Faith's school had hot lunch and she wanted that, so only the boy needed lunch. He's fairly easy to please and the only thing he requested was the rest of the pineapple. Easy enough! 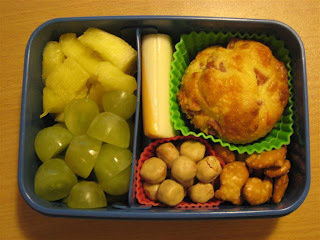 The boy had a stuffed corn muffin (I think it's a corndog one), some cheese, pretzels, dried fruit covered in yogurt, the rest of the pineapple and some grapes. Easy enough!